Dixita Mour is a student currently pursuing her masters in Commerce. She is a passionate blogger and a twitter enthusiast. She loves feeding birds and teaching. The author makes beautiful handicrafts. The book,as the author claims it to be, is a goldmine of fascinating blog posts. 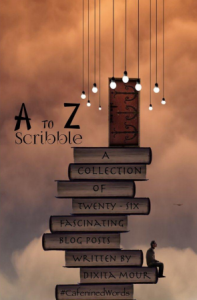 The book is a collection of the April A-Z challenge posts from her blog. The book is a mix of genres and a feast to the reader’s soul. The author introduces you to queer words and then surprises you by showing how well we are all connected but yet did not know about the word. She shares true authentic stories in a post and flaunts her collection in another. She speaks about her fears and shares the bitter-sweet experiences that she has had. Her love for handicrafts and birds she professes in her posts. The author pours her heart out about her grandparents and about the times when her heart beats faster than usual and when she can’t stop herself from blushing.From mundane things she draws out inspiration. She has a lot more to show and share. The book does that. The writing is simple and heart warming. The author’s style of writing will make you fall in love with her. A little grammatical revamp would make the book , one of the best. I have read the author’s post in the challenge and again in the month of May. The variety of genres makes the book a anytime anywhere read. I would suggest it to be a weekend read. You can indulge in the weekend and retrospect on Monday. The post is written for Day 4 of #Halfmarathon by Blogchatter. I typically don’t read books that are a collection of blog posts, possibly because I am biased towards full length novels. Which is also the reason I don’t read many short stories or anthologies. This is the first time I am trying my hands on anthologies too. Felt the bloggers deserved a review for the brilliant work. I am glad it makes you feel special. I myself wouldn’t consider my blog posts worthy of being published, more so because my posts are mostly random ones that are rarely interconnected. But yes, in an A-Z challenge one would be writing on a theme and it would make sense as a good book.